Is Your Open House a Mad House? I recently read Mrs. Q's post about her school's "Meet Your Teacher" night. She has some great ideas that she implemented for her evening and even provides a template for an informative Keynote presentation that you can customize to meet your needs. Her opening description of how this type of event goes in a music room made me laugh, because it sounded so familiar. If you are a music teacher, you understand how loud and chaotic these nights are when you mix crowds of people with drums, xylophones, and other exciting instruments. My school's Open House is near the end of the year, and I have to admit that our classroom teachers are brilliant! Some of them have their students create a list of places to visit, such as the gym, art room, music room, and media center. After a brief time in the classroom, students are encouraged to take their parents and siblings on a tour of the building. While the classroom teachers prepare to leave on time, it seems the entire student body & family are in the music room playing drums, xylophones, and anything else I was unable to hide. Okay, I exaggerate a little, but it really does get crowded, loud, and chaotic. I love getting to know parents, but it's impossible to have a conversation with the noise and the stress of watching 2-year-old children bang on $1300 instruments. I've watched mallet heads fly across the room while parents are oblivious, and students who would never run around banging drums or digging through instrument bins during class seem to believe everything in the room is free game during Open House. I used to attempt to put as many instruments out of harm's way as possible, but there are only so many places to hide numerous large instruments. I needed a solution to the madness, so Open House would be a pleasant experience. In addition to running a slideshow, I've tried one other activity that went fairly well. It was actually just a way to organize the chaos, but it also served to educate the parents about what we do in music class. 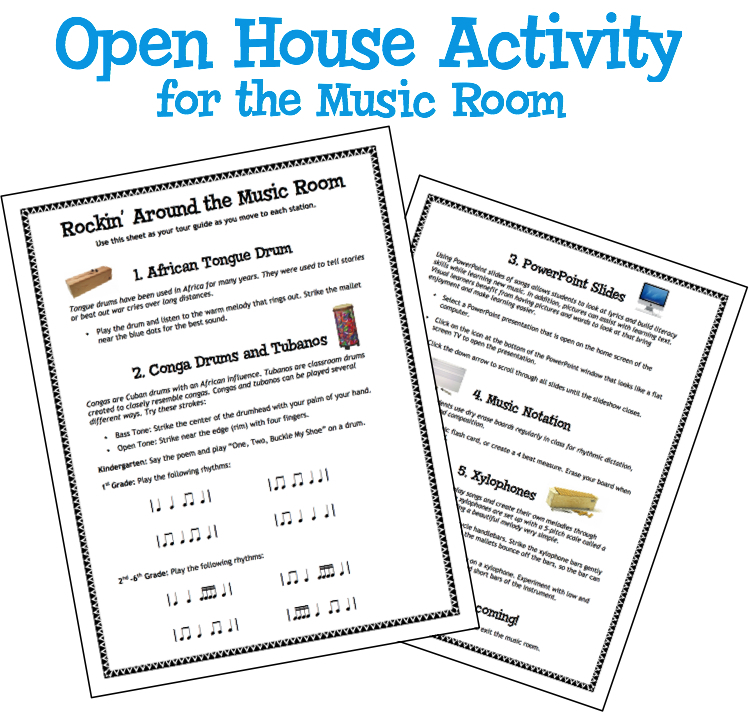 I set up stations in the music room, and created a handout to serve as an educational guide. I gave specific directions about what to do at each station and gave brief background information about some of the instruments. The goal was for students to complete each station while educating parents about what they are learning in music. Meanwhile, the plan was for me to be able speak to parents at the door as they entered or exited the room. 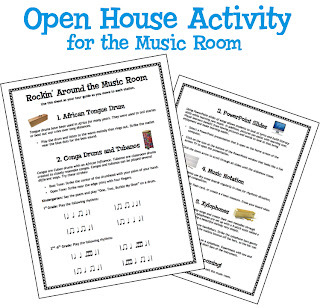 I can't say that it worked perfectly, but I feel that the handout and stations gave parents an idea of some of the things their children do in music class, and the stations kept people moving around the room with purpose. If you want to further reduce the chaos, you could select stations that do not require playing instruments. Students could demonstrate music software, games, manipulatives, flashcards, whiteboards, smartboards, among other activities. Do you have strategies for a successful Open House? I'm always looking for new ideas, so please share! Have you used a Google Form? I am just learning how to make my life much easier with this little goodie. I may be a little behind the times on this incredible tool, but I just didn't know what I was missing. I believe that people rarely learn to use new tech tools until they have a real-world application for them. Once someone has a legitimate use for new tool, it is worth the effort to figure it out. A need for quick information is what led to my recent discovery of Google Forms. Our 5th grade students are preparing for a Veterans' Day Program, and solo auditions will be held this week when our students are dismissed early for Parent/Teacher conferences. Rather than typing up permission forms, printing them, handing them out, sending them home, and waiting for them to be returned, I simply created a form in my Google Drive. This has been the perfect opportunity to test a Google Form to see how much it could help me do my job. One really cool feature is that I could embed the form into my school web page. However, the most awesome feature is that the submitted results are automatically entered into a spreadsheet in my Google Drive. That is amazing! I no longer need to collect forms and create an audition list by day. Now I can simply sort the spreadsheet and print. Sign up for a Google account, if you do not already have one. Click here to register. Click on the red "Create" button, then select "Form." Create your questions. There are choices for question types, and you can mark questions as required, if needed. You can select a theme. The form or link can be e-mailed, or the form can be embedded in your web page. As completed forms are submitted, the results are directly entered into a spreadsheet that you will see in your Google Drive. Sit back and enjoy the time and paper you saved by using this remarkable tech tool. To use this image in a PowerPoint, open it, right click, copy, and then paste it into a new Ppt presentation. 2. Students pat the beat while they sing, and I add a solo turn for each student to sing into the microphone: "I'll be a _____." Then the student moves to a xylophone to play the bordun, and then rotates through the instruments. I adapt the number of instruments to the level of the class and what will make the activity run smoothly. 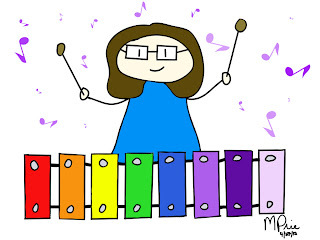 I want to focus on the students' singing voices first, so sometimes I do not even use the xylophones during the first introduction of the song. I extend the activity on another day. 3. During another class period, I place a box of masks and animal headbands behind a large bush that is in my room, which was a prop in a play. The box could also be placed behind a piano or other large piece of furniture. 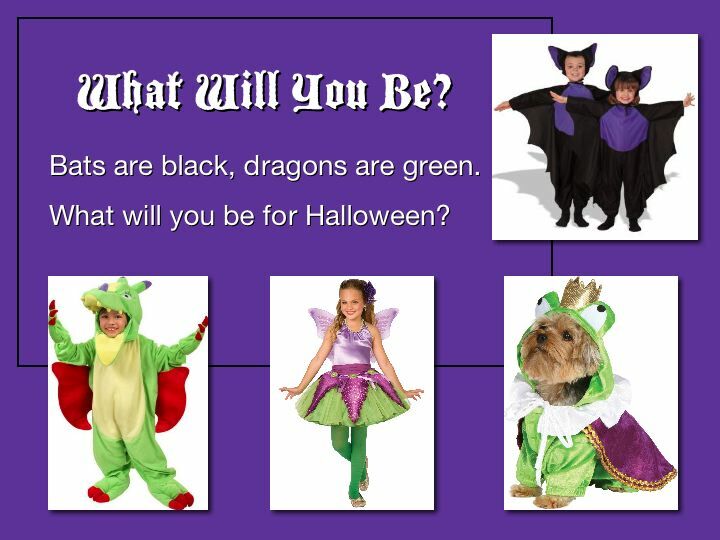 One child hides behind the bush and selects a "costume" and pops out at the end of the song wearing what he/she selected. 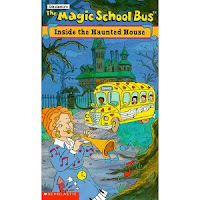 The child sings "I'll be a _____" into the microphone that is placed in a handy spot for the students to grab as they are exiting the hiding spot. I have an empty tub for them to place used items in, so no one picks the same thing. It helps to have one child selecting an item, while one is dressed and waiting to pop out. Then they are ready at the end of the song and the activity moves quicker. I have organized the game in different ways. I have set up xylophones and other unpitched percussion instruments in a circle and had the students move around the circle. One place has a polyspot, which indicates it is time to move behind the tree. Other times, I have simply used my regular instrument rotation, and have a certain position that goes to the bush. My barred instruments are set up in 3 rows. Children move to the right on row one, back to row two and then to the left, back to row three and to the right. When they reach the final instrument they circle around the front to the beginning of row one. I walk through the rotation pattern and call it "zig" on row 1, "zag" on row 2, "zig" on row 3, then "zooooom" around the room back to 1. The zoom is a great place to move to the bush. I began using this lesson with kindergarten and first grade a few years ago. Now, my older children see the bush in position for the game and beg for this activity. I've promised my 3rd graders that they will get to play this year, and I'm sure they won't let me forget. This is one of those activities students will remember with fondness. Who doesn't enjoy dressing up and playing instruments? I know I do! Are you ready for some October fun? My K-1 students are! 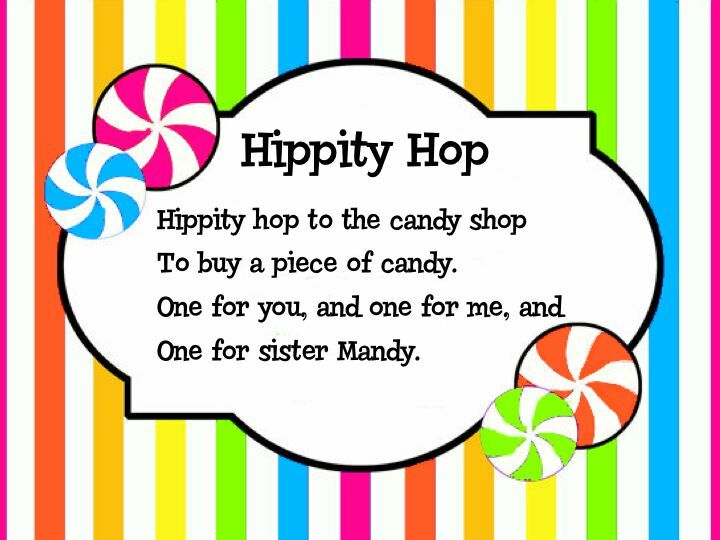 Here is a nursery rhyme that allows them to work on steady beat and pitch-matching skills, while singing about one of their favorite things: candy. We sang "Macaroni" last week, which included singing solos, galloping on a stick pony, and playing a steady beat bordun on xylophones. You can read about "Macaroni" here. It was the first time for my kindergarten students to play the barred instruments. 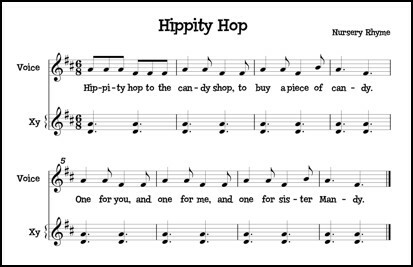 Therefore, I wanted to continue working on the steady beat bordun this week while continuing to focus on the singing voice, and "Hippity Hop" seemed like the perfect lesson choice. Jeff & Randy have an arrangement of this song in the first grade GamePlan. (If you do not have this book, I highly recommend it!) They use only "sol" and "mi" for the melody, which is perfectly fine. However, I find that my students naturally add "la" in certain places, and I sometimes I get tired of fighting that battle. I really love the question and answer they added to the poem. The teacher sings, "What's your favorite candy?" and a soloist answers, "I like _____." Of course, I rarely follow a lesson plan exactly. So, although I found this wonderful song and lesson idea in GamePlan, the activity has evolved and changed over time. My lessons seem to vary from class to class, depending on student suggestions and where the class leads based on what they seem ready to do. Sometimes an idea comes to me right in the middle of an activity that I think will improve the lesson. In addition to adding "la" to the melody, I also did something different with the question at the end of the song. Since we have done a lot of solo-singing in our classroom microphone, I felt that my students could take over the teacher solo. Instead of me asking the question, I let one student sing the question and another student answer. We turned it into a circle game and added two xylophones to the mix to practice playing the steady beat. Students sat in a circle, and the student who was "it" walked around carrying a Hershey's Kiss pillow that I happen to already have. 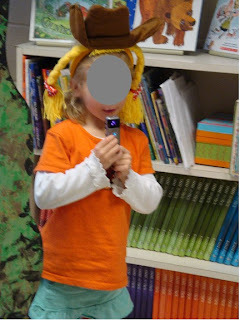 The child also held a microphone that is part of our classroom amplification system. He/she skipped around the circle (or hopped) while the class sang and played the beat on their legs. The leader stopped at the end of the song and dropped the Hershey's Kiss into a friend's lap. The first student sang the question, then handed the mic to the seated student who sang the answer. One thing that is helpful for younger students is to pause before the game starts and let children think about what candy they want to sing about when it is their turn. It helps for them to have an answer ready. Next, students rotated to a new job: "It" moved to xylophone 1 to play the steady beat bordun, and the chosen student became "It." After the next round, the student at xylophone 1 moved to xylophone 2, etc. I had one first grade class that was more advanced, so I tried a different option. I allowed half the class to move to the barred instruments to accompany the rest of the class while they played the game. They even wanted to rotate through the instruments after each turn. Some classes would not handle that many different activities at once, but they did a beautiful job. After everyone in the circle had a turn, the groups switched jobs. There was just one problem I had while teaching this lesson. 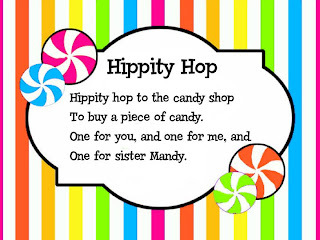 When I was giving an example of how to sing an answer to the question, I had a hard time picking just one favorite candy. I guess a teacher should like Smarties, but Pay Days are always nice! One of my favorite songs to use for introducing the xylophones to kindergarten students is "Macaroni." I love to use this lesson, because it offers several activities at once. Therefore, all students are engaged throughout the game and I can work with a couple of students at the instruments. This game is so popular, that we vary the lesson slightly and play it again in first grade. I introduce the song by unveiling the PowerPoint presentation pictured above with the funny picture. I think it is important for visual learners and emerging readers to see the text as we sing songs, so I create PowerPoint slides for most of the music we learn in K-1. Although I sometimes use PowerPoint slides with all grades, I usually display actual music for them to read as they get older. Work on the solo at the end. Really extend the notes, so that students will have time to hear the pitch and be more successful when they sing by themselves. Use hand signs to demonstrate the melodic direction. If this is the first time students have ever played the xylophones, I remove the bars surrounding the ones they will play so they can focus on form, rather than trying to find and strike the correct bars. Class sits in semi-circle with two xylophones in front of the class. One student gallops on stick pony while everyone sings the song and pats the beat on their legs. 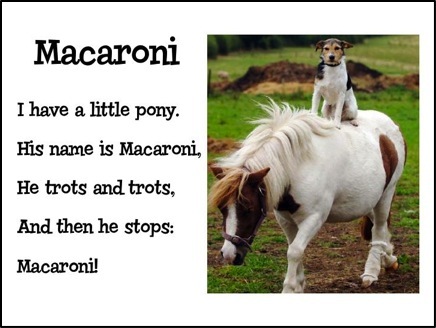 The pony rider then hands Macaroni to the soloist, who becomes the new rider. The first rider moves to the first xylophone. Play game again with a student on the xylophone, and assist the student as needed. Continue until all students have had a chance to sing the solo, ride the pony, and play two xylophones. How perfect that today was Cowboy Day in kindergarten! Review song, hand signs, and solo. My instruments are set up in 3 rows (I have 18 barred instrument). I walk through and demonstrate the rotation procedure prior to students moving to instruments. Students rotate through the instruments by moving down row 1, back to row 2, across row 2 in the opposite direction of row 1, then back to row 3, and across row 3 the same direction as row 1. After the final instrument on row 3, they move to the opposite diagonal corner of row 1. I call it "zig, zag, zig, zooooom." (The pattern is a little like a Z, zigging and zagging back and forth on the rows, then zooming from the back corner to the front one. Use whatever configuration and rotation pattern works best for your space. In addition to the instruments, set up 2 stations for the pony and for the solo. After the final instrument on row 3, students move to the open area and ride the pony. After the pony, they move to a microphone for the solo. Then they move to row 1 of instruments. Play the game until students have moved through each spot. Take a ride on Macaroni, the pony, and get with the beat! 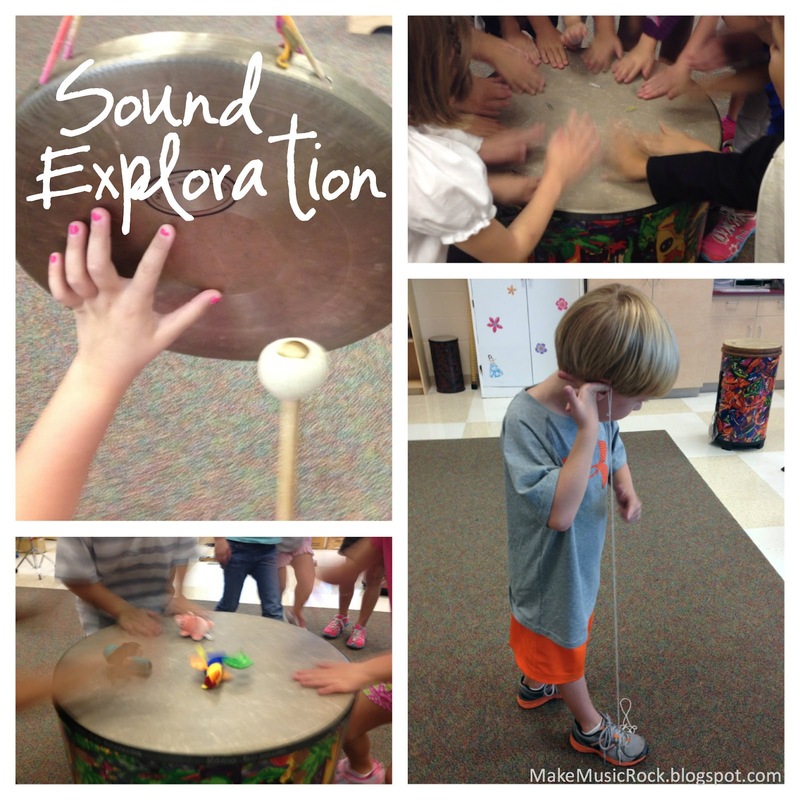 Our kindergarten students recently studied sound in their classrooms, so we enjoyed exploring sound vibrations in the music room. Have each child play a gong or hand drum for a classmate to touch gently with fingertips in order to feel the vibrations. Play a contrabass bar and let children touch the sound box or the end of the bar to feel vibrations. Let each child play the vibraslap to see how it shakes when it makes sound. Place paper clips on a conga, tubano, or gathering drum. Allow children to play the drum and watch the paper clips vibrate. I let a few children play at a time. When all the paper clips were off, their turn was over. It did not take long, and then they picked up the clips for the next group. Hold a large hand drum over paper clips that are lying on the conga, tubano, or gathering drum. Play the drum with a mallet and see if the paper clips can move without touching the drum head on which they are resting. This is a good visualization of sound waves moving through the air. Experiment with other items on the drum, such as small finger puppets. See if the vibrations can move the items. Take a string with a small loop tied in the end. Step on the opposite end and put it taut. Place pointer finger in small loop. Lean forward so string does not touch anything. Touch pointer finger with string loop directly in front of ear. (See bottom right picture in the photo collage at the top of the post.) Pluck the string and listen. Experiment with pulling the string tighter and less taut. Kindergartners need help with this activity, but older students can handle it alone. We have a classroom set of strings that we use with upper grades. They can all play at the same time. The individual can really hear their string, but it is almost impossible for the rest of the class to hear. The children love to play along with music. 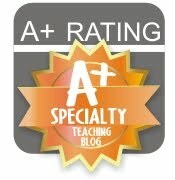 There are also some great resources available to help as you teach about sound. The Magic School Bus "Inside the Haunted House" is always a favorite with our K-3rd grade classes. I also found a website with listening exercises that encourage listening skills and require sound discrimination. Although I did not have time in music for these listening games, I sent a link to the classroom teachers and they seemed to like it. I hope this gives you some easy ideas to demonstrate how sound is created. These activities can be done quickly without taking an entire class period, so get shaking! 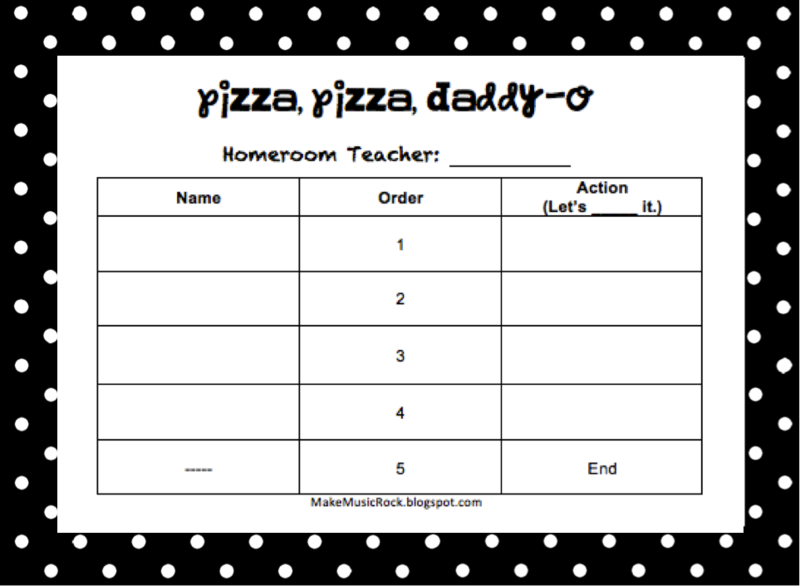 "Pizza, Pizza, Daddy-o" is always a favorite with our second graders, so we have enjoyed working on this song for the past couple of weeks. Not only is it fun, but this call and response song provides many opportunities for musical growth. Janet and I both begin teaching the song to our classes a cappella. We model the song and have the children perform hand signals as they sing the choral response to the solo. They experience success because we start slowly and there are only two signs for this part: sol and mi. Through the use of a document camera, we project the music on the screen for the children to follow. 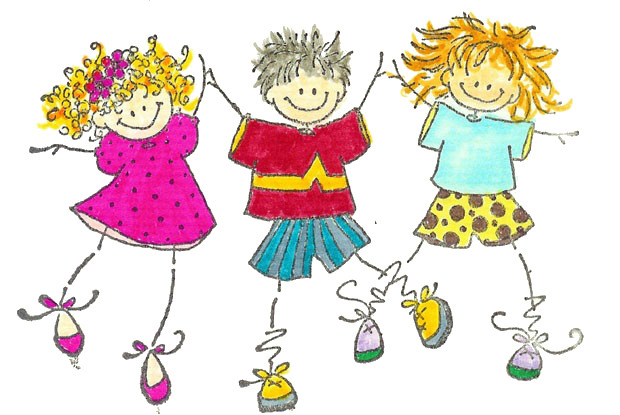 We track the music as the children sing, to ensure that children are focused on the right spot. As students follow along, they gain skills in reading music notation. They begin to identify melodic direction, and they notice different types of notes and the locations of those notes (line vs space, step vs. skip, high vs low, etc.). If you need the melody of this song, Beth has it posted on her blog at Beth's Music Notes. After learning the song, we listen to the stereo vocal track on the 2nd grade Silver Burdett Making Music CD (1:36). The students absolutely LOVE it! (This is an African American singing game that is found in other textbook series, as well.) We have them sit while they listen at first, so they can focus on the music. We encourage students to move while seated, because it is impossible to sit still while listening and it prepares them for the next step. During the interlude, we allow them to stand up and finish the song while improvising their own movements in place. Next, we sit back down and teach the foot movement found in the textbook, which is basically a criss-cross while alternating the front foot during the "pizza, pizza, daddy-o." At first, we use hands to pat the foot pattern on the the floor. This helps students get the pattern before trying it with their feet. When they are ready, we stand and sing the song without the voices on the CD and perform the movements. Then we layer in the CD accompaniment. We do not spend an entire class period learning or singing the song. Rather, we spend shorter increments of time on several occasions, so that the song is cemented in the children's minds before beginning our next activity, which is a collaborative project. We discuss words that would work well and words that would not work well prior to moving into groups. We also talk about the importance of picking a word that gives a clear direction of a movement to do. "Make it" is not as specific as "Build it," and classmates may be confused about what to do. Therefore, they should choose more descriptive words for their lines of the song. Each student is responsible for his/her box on the form. The group should discuss each member's choice, but peers should be supportive. If the word is an appropriate choice, then they use it. If it does not work for some reason (i.e. not an action verb), the students must respectfully explain why and let the child pick a new word. The group shares one pencil, and each child writes his/her own response. This maximizes group participation, rather than one child taking over the project. It is a cooperative project, so students should be kind and work well together. After the group completes the form, they create movements for each line and practice leading the song. Finally, each group stands in front of the class and leads the song using their created lyrics. It is a good idea to have a music stand for their forms, so they will be confident as they lead the class. From singing, moving, and creating lyrics, we will soon transition to playing instruments. After being told that sol is a G, students will explore the barred instrument to find mi. It may help to point to hand signals that are posted in order to demonstrate that mi is two steps down from sol. Next, we will sing the song and play the sol-mi patterns of the chorus parts. When they are successful and ready for a new challenge, we will have them find la-sol-la and play that pattern whenever it occurs in the solo part. Finally, we will divide the instruments and have one group play the call and the other play the response.